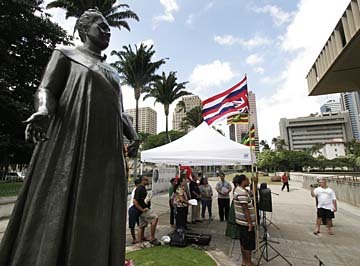 With the statue of Queen Liliuokalani seemingly looking on, Hawaiian activists held a news conference yesterday near the state Capitol to oppose a proposed ceded-lands settlement. A proposed $200 million settlement between the Office of Hawaiian Affairs and the state over the use of former monarchy lands appears dead for this session. Last night, three Senate committees rejected the proposal - the result of four years of negotiations between OHA and the state. Sens. Jill Tokuda, Brian Taniguchi, Clayton Hee, Mike Gabbard and Russell Kokubun voted to reject the bill, House Bill 266, effectively stopping the measure for this year. Hee (D, Kahuku-Kaneohe), a former OHA chairman, said that not enough was known about how the state and OHA reached their agreement and how it would benefit the native Hawaiian beneficiaries. The senators represented the Committees of Water and Land, Agriculture and Hawaiian Affairs, and Judiciary. Yesterday the committees heard more than five hours of mostly negative testimony regarding the bill. The $200 million settlement proposed between the Lingle administration and the Office of Hawaiian Affairs would resolve a long-standing obligation the state has to pay OHA for disputed ceded-land revenues. The state would agree to give OHA $13 million and an additional $15 million a year, which is estimated to be about 20 percent of the revenues generated by the public land trust. The state would give OHA land at Kewalo Basin, Kalaeloa and Banyan Drive on the Big Island worth $187 million. The settlement would not disturb native Hawaiian claims for sovereignty, according to Haunani Apoliona, OHA chairwoman. 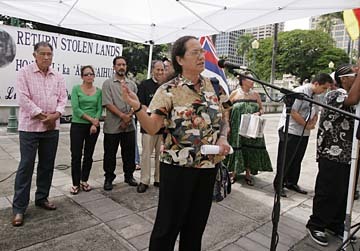 Mililani Trask was among those speaking at yesterday's news conference against the proposed ceded-lands settlement. A $200 million deal between the state and the Office of Hawaiian Affairs to resolve a 30-year dispute over the use of ceded lands appears to have failed. The chairmen of the Committees on Water and Land, Judiciary, and Agriculture and Hawaiian Affairs said last night that they could not approve the settlement. The rejection effectively kills the bill for this year, unless a compromise can be fashioned by OHA, the Lingle administration and the Legislature. "They are holding the bill. It does not move forward. It is not likely the House will hear the Senate bill, so it is basically dead," said Haunani Apoliona, OHA chairwoman. "There is no agreement. The disputed issues remain unresolved." Attorney General Mark Bennett said he was disappointed because the debt has been owed for 30 years, and the state had negotiated with OHA for four years. "The senators have chosen to reject it. I hope the bill can be revived, but if it isn't, the responsibility for this issue is where it started under the state Constitution -- with the Legislature, and I hope the Legislature will resolve it," Bennett said. Gov. Linda Lingle is the third Hawaii governor to work on a settlement for ceded lands, or former monarchy lands. When the settlement was announced on Jan. 18, Lingle said it would resolve any and all claims relating to income and proceeds from ceded lands. "While we have had a clear, constitutional obligation since 1978 to share ceded-land revenues, the amount has always been in dispute," she said. Lingle called the settlement "reasonable, fair and just," but senators said too many people raised too many questions about the deal. For instance, three former OHA trustees and one current OHA trustee, Rowena Akana, testified against the settlement yesterday. "OHA's mission is to advocate for the betterment of our beneficiaries," Akana said. "I cannot support a bill that will extinguish the rights of all our beneficiaries to future entitlements, including rights to surface, ground water and mineral resources." Also speaking against the bill were former trustees Clarence Ku Ching, Moanikeala Akaka and Mililani Trask. Trask said there were no assurances in the bill that money from the settlement would reach native Hawaiians. "In reality, Hawaiians live and die in poverty because OHA has withheld hundreds of millions of dollars from those who need it most: the Hawaiian people," Trask said. Sen. Clayton Hee (D, Kahuku-Kaneohe), who was OHA chairman when former Gov. Ben Cayetano attempted to negotiate a different settlement with OHA, said in previous negotiations all parts of the settlement were justified and explained. "With this, there is an unknowing of what is in the details," Hee said last night. "We could not understand the basis of the agreement." Earlier in the day, Senate President Colleen Hanabusa said she was concerned about the settlement because native Hawaiians said they were not involved in the negotiations. "There is the potential for cutting off rights, and it behooves everyone to slow it down," Hanabusa said. Sen. J. Kalani English (D, Maui-Molokai-Lanai) said many native Hawaiians said they had not been consulted. "Across the board, my Hawaiian constituents are saying that if OHA gets the money, we aren't going to see any of it," English said. "I think the bill is onerous and that drawing it up without consultation makes it problematic."